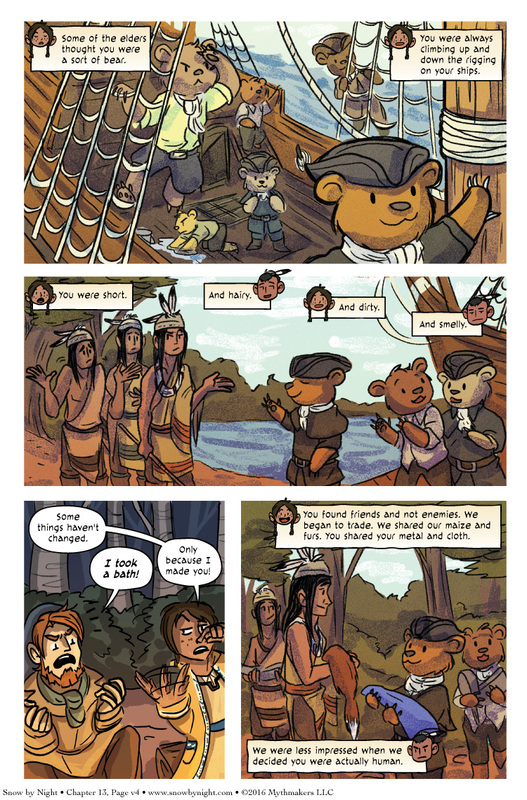 Da Bears arrive on Page 4 of How We Decided You’re People! Ah sailing bears. Who wouldn’t love them? If you want to see what the bears get up to next, please vote for Snow by Night on Top Web Comics! This vignette was inspired by two things. The first was a section in one of the history books I read that retold that some of the First Nations did think the French were some kind of mutant bear at first because they were so short, smelly, and hairy. The second is a speech by Red Jacket, a Seneca orator who is one of the greatest American speakers. According to whom? According to William Jennings Bryan, who knows a few things about oration. Read Red Jacket’s speech for yourself. My thanks to Mittie Paul for the art! Okay, I vote for being bears! I can’t say I blame them. Seafaring bears sounds much more interesting to me, too! Bear with it, smallpox is coming. I really like this comic, but I hate how the RSS feed brings me here and not to the comic itself. If I haven’t read a few updates worth, I have to go to the most recent one then go backwards to find the last one I read. It frustrates me. While I understand the frustration (I want to see the comic first, *then* the commentary), there are links directly to the page in each commentary. I’m really glad that you’re enjoying the comic! Thank you so much! I can do that without problem if it would help. 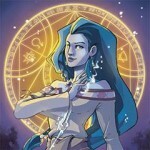 Also, you can always see the list of journal entries at http://www.snowbynight.com/Journal/. This link is in the footer of every page. Oh, so THAT’s why it works like that. Thanks for the explanation, I’ve always wondered. Putting the link like that works great (speaking from today’s comic), thanks! Is it too late to vote to change our species? Because i want to be a bear. Well … there are ways to modify person’s DNA at least theoretically, but it’s pretty hard to do to adult and lot of genes wouldn’t activate anyway because it would be too late for them. It’s easier to change children … I mean embryos. But they are too young to vote and might disagree with your decision later.